Ripmax SD100 servos are the archetypal servo for dlg. However, a 1s 3.7v +LiPo drive will not provide the torque necessary for total comfort, especially in a full size fast 1.5m dlg. 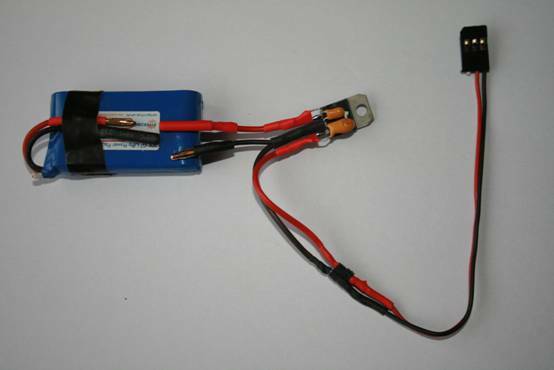 An 8.4v 2 cell LiPo battery alternative, often used by the competition fraternity, would provide adequate torque but servo durability suffers and there are not too many RX's that will cope with this voltage. A 5 or 6 v voltage regulator (VR) used with 2 cells might be a better sport alternative with expected servo life better than a season. Commercial VR's capable of 1 amp at 5 or 6v are about £6-£8 and weigh about 9-12gm. There is an Ebay 1.5gm VR with an alleged 1 amp output but it has a 500ma chip and I would hesitate to use it. The use of the UBEC output of a 2/3 cell ESC is a possibility but for a 1 amp UBEC output, an 8-10 amp ESC is required which is heavy at 10-12gms. 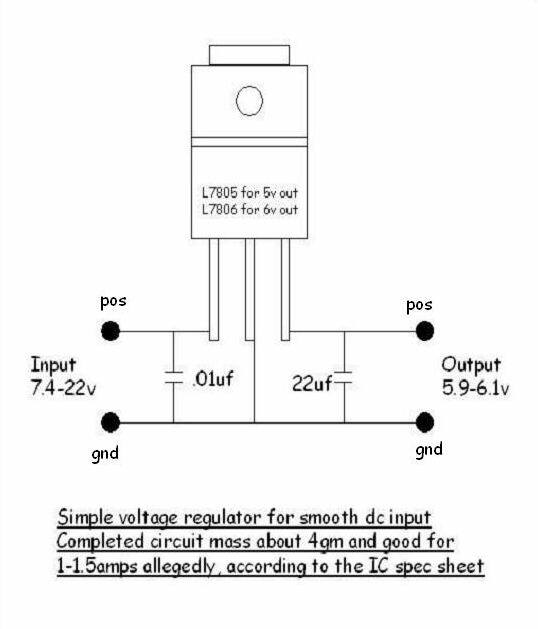 A home brew alternative using an L7805 for 5v out or L7806 for 6v out is an option. The IC costs about 25p from China (look on Ebay) and 2 electrolytic capacitors, costing pence, complete the circuit. The VR weighs about 4gm and can be made in about 5mins. The circuit is shown below. The VR is shown alongside a Hyperion G3 450mah 2s LiPo together with the wiring to connect to a RC RX. Connectors are 2mm bullets for the Input and SIL connector for the Output. I have made up 3 for my own use but if anybody wants to bulk order IC, capacitors, wiring and connectors, I would be happy to demo an assembly and functionality check at Peakirk sometime.